← Excellent Authentic Greek Food in L/A! 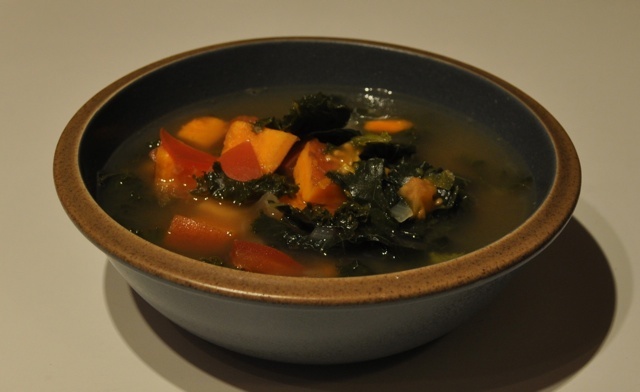 This is another recipe that was submitted by a student for the healthy recipe contest and cooking demonstration held on February 17th.Â While the recipe calls for chicken broth, vegetable broth could be substituted to make it a true vegetarian soup. I made some modifications to the recipe mainly to be able to make it from what I had at home.Â I also used dry beans which I soaked and cooked ahead of time.Â To save on energy usage, I cooked about two pounds of beans and froze what I did not need for the soup.Â Now I have some containers of precooked beans ready to throw into other recipes. I also used homemade chicken broth since I realized I could pay $5.99 for a whole rotisserie chicken, already cooked (easy dinner, leftovers for lunch the next day, and boiled the rest to make a large pot of broth) OR I could pay about the same amount for two quarts of high quality broth.Â In addition to having two meals from the chicken, I made enough broth for this soup, froze three cups for future use in a chicken pot pie or Spanish rice, and I have about 1.5 c. of leftover pulled chicken in the freezer for another recipe.Â All in all, a much better deal than buying prepared broth, and much lower in sodium! Saute the onion and garlic in the olive oil in a large soup pot.Â Pour in broth.Â Add all other ingredients except noodles or rice.Â Simmer until potatoes are soft.Â Add in soup noodles or rice. This entry was posted in Soups and Stews, Veggies & Grains and tagged recipe. Bookmark the permalink.